Fast food giant McDonald’s announced it would raise wages and offer benefits to employees at 1,500 company-owned US restaurants. The decision won’t effect the wallets of 90 percent of employees who work at more than 3,000 franchise-owned restaurants. McDonald’s announced Wednesday it will increase wages by $1 over the legal minimum wage, to an average of $9.90 an hour by July 1, with an additional increase to more than $10 by 2016. 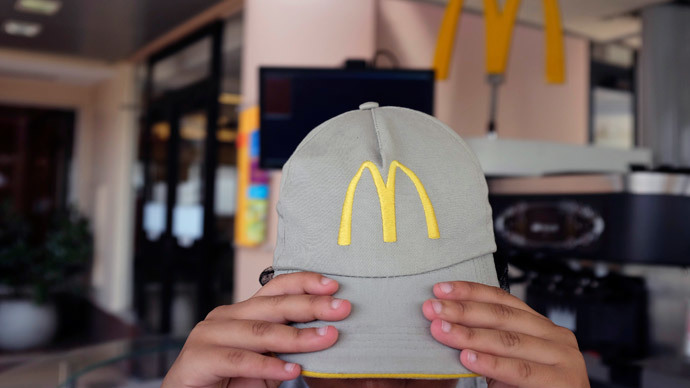 “We’ve been working on a comprehensive benefits package for our employees – the people who bring our brand to life for customers every day in our US restaurants,” said McDonald’s President and CEO Steve Easterbrook in a statement. Workers will also be able to accrue up to five days of paid time-off annually after a year of employment. Part-time workers, working 20 hours a week, will accrue 20 hours off a year. If the days aren’t used after the year is up, they will get extra pay. The company will also expand its education benefits and offer free high school completion, and college tuition and credits assistance to all its 750,000 employees, plus free English language classes. “We believe that education is the true game changer as it helps our employees succeed, within our company and beyond,” said McDonald’s US President Mike Andres. The pay increase, however, is not mandatory for 90 percent of its employees. Those 660,000 employees are working at more than 14,000 McDonald’s restaurants which are independently owned under 3,100 franchise operators. McDonald’s said franchise owners are free to make their own decisions about pay and benefits. Currently, the federal minimum wage is $7.25 an hour and hasn’t increased since 2009 despite appeals to Congress by President Obama. Lawmakers in 29 states, due to popular pressure and demand, have raised their minimum wage above the federal level. The McDonald’s decision echoes Walmart’s decision to raise hourly wages to at least $10 an hour next year for its half a million employees, partly to be compliant with state minimum wage levels. The decision also comes on the heels of a popular national protest movement organized by Fast Food Forward, a group backed by the Service Employees International Union, which demands raising fast food worker’s pay to $15 per hour. The next round of protests is scheduled for April 15. McDonald’s told the Wall Street Journal the protests were not a factor in their decision.